Forty years ago, Mark L. Batshaw, M.D., almost singlehandedly wrote a 23-chapter first edition that ran about 300 pages. Now Dr. Batshaw’s tome, “Children With Disabilities,” is in its eighth edition, and this new volume is almost 1,000 pages, with 42 chapters, two co-editors and over 35 authors from Children’s National. Back in 1978, Mark L. Batshaw, M.D., was a junior faculty member at John’s Hopkins University School of Medicine. In the evenings he taught a course in the university’s School of Education titled “The Medical and Physical Aspects of the Handicapped Child,” for Master’s level special education students. Because no textbook at that time focused on that specific topic, Batshaw developed his own slide set. “At the end of the first year of teaching the course my students said ‘You really ought to consider writing a text book based on your slides to help us move forward,’ ” Dr. Batshaw recalls. The father of three carved out time by writing on weekends and at night, cutting back on sleep. His first goal was to create a textbook that would serve as a curriculum for a series of courses that would be taught at universities to specialists who work with children with disabilities, including social workers, physical and occupational therapists, speech and language pathologists, special education teachers, nurses, doctors and dentists. His second aim was for the book to serve as a reference text for professionals in the field. The 33-year-old contacted a brand-new new publisher, Paul H. Brookes Publishing Co., that focused on special education. “They took a chance on me, and I took a chance on them,” he says. Forty years ago, he almost singlehandedly produced a 23-chapter first edition that ran about 300 pages. Now Dr. Batshaw’s tome is in its eighth edition, and this new volume is almost 1,000 pages. And, rather than being its sole author, Dr. Batshaw enlisted two co-editors and at least five dozen authors who contributed specialty expertise in genetic counseling, social work, physical and occupational therapy, medicine and nursing. His daughter, Elissa, a special education teacher and school psychologist, authored a chapter about special education services, and his son, Drew, an executive at a start-up company, contributed autobiographical letters about the effect ADHD has had on his life. Excerpts of recent research articles. Now a bestseller, there are more than 200,000 copies in print, including Portuguese and Ukrainian translations. “It didn’t start that way. It grew organically,” he says. In addition to Dr. Batshaw, Children’s contributors to “Children With Disabilities” include Nicholas Ah Mew, M.D., pediatric geneticist; Nickie N. Andescavage, M.D., neonatologist; Mackenzie E. Brown, D.O., fellow in Pediatric Rehabilitation Medicine; Justin M. Burton, M.D., chief, Division of Pediatric Rehabilitation Medicine; Gabrielle Sky Cardwell, BA, clinical research assistant; Catherine Larsen Coley, PT, DPT, PCS, physical therapist; Laurie S. Conklin, M.D., pediatric gastroenterologist; Denice Cora-Bramble, M.D., MBA, executive vice president and chief medical officer; Heather de Beaufort, M.D., pediatric ophthalmologist; Dewi Frances T. Depositario-Cabacar, M.D., pediatric neurologist; Lina Diaz-Calderon, M.D., fellow in Pediatric Gastroenterology; Olanrewaju O. Falusi, M.D., associate medical director of municipal and regional affairs, Child Health Advocacy Institute; Melissa Fleming, M.D., pediatric rehabilitation specialist; William Davis Gaillard, M.D., chief Division of Epilepsy, Neurophysiology and Critical Care; Satvika Garg, Ph.D., occupational therapist; Virginia C. Gebus, R.N., MSN, APN, CNSC, nutritionist; Monika K. Goyal, M.D., MSCE, assistant chief, Division of Emergency Medicine; Andrea Gropman, M.D., chief, Division of Neurodevelopmental Pediatrics and Neurogenetics, geneticist and Neurodevelopmental pediatrician; Mary A. Hadley, BS, senior executive assistant; Susan Keller, MLS., MS-HIT, research librarian; Lauren Kenworthy, Ph.D., director, Center for Autism Spectrum Disorders; Monisha S. Kisling, MS, CGC, genetic counselor; Eyby Leon, M.D., pediatric geneticist; Erin MacLeod, Ph.D., RD, LD, director, Metabolic Nutrition; Margaret B. Menzel, MS, CGC, genetic counselor; Shogo John Miyagi, Ph.D., PharmD, BCPPS, Pediatric Clinical Pharmacology fellow; Mitali Y. Patel, DDS, program director, Pediatric Dentistry; Deborah Potvin, Ph.D., neuropsychologist; Cara E. Pugliese, Ph.D., clinical psychologist; Khodayar Rais-Bahrami, M.D., neonatologist and director, Neonatal-Perinatal Medicine Fellowship Program; Allison B. Ratto, Ph.D., clinical psychologist; Adelaide S. Robb, M.D., chief, Division of Psychiatry and Behavioral Sciences; Joseph Scafidi, D.O., neonatal neurologist; Erik Scheifele, D.M.D., chief, Division of Oral Health; Rhonda L. Schonberg, MS, CGC, genetic counselor; Billie Lou Short, M.D., chief, Division of Neonatology; Kara L. Simpson, MS, CGC, genetic counselor; Anupama Rao Tate, D.M.D., MPH, pediatric dentist; Lisa Tuchman, M.D., chief, Division of Adolescent and Young Adult Medicine; Johannes N. van den Anker, M.D., Ph.D., FCP, chief, Division of Clinical Pharmacology, Vice Chair of Experimental Therapeutics; Miriam Weiss, CPNP-PC, nurse practitioner; and Tesfaye Getaneh Zelleke, M.D., pediatric neurologist. Billie Lou Short, M.D., received the Ninth Annual Mentorship Award in Clinical Science. 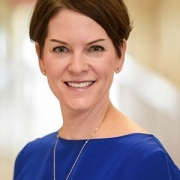 People joke that Billie Lou Short, M.D., chief of Children’s Division of Neonatology, invented extracorporeal membrane oxygenation, known as ECMO for short. While Dr. Short did not invent ECMO, under her leadership Children’s National was the first pediatric hospital to use it. And over decades Children’s staff have perfected its use to save the lives of tiny, vulnerable newborns by temporarily taking over for their struggling hearts and lungs. For two consecutive years, Children’s neonatal intensive care unit has been named the nation’s No. 1 for newborns by U.S. News & World Report. 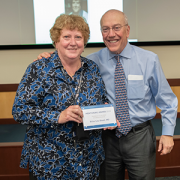 “Despite all of these accomplishments, Dr. Short’s best legacy is what she has done as a mentor to countless trainees, nurses and faculty she’s touched during their careers. She touches every type of clinical staff member who has come through our neonatal intensive care unit,” says An Massaro, M.D., director of residency research. For these achievements, Dr. Short received the Ninth Annual Mentorship Award in Clinical Science. 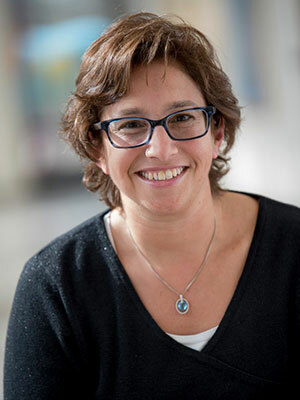 Anna Penn, M.D., Ph.D., has provided new insights into the central role that the placental hormone allopregnanolone plays in orderly fetal brain development, and her research team has created novel experimental models that mimic some of the brain injuries often seen in very preterm babies – an essential step that informs future neuroprotective strategies. Dr. Penn, a clinical neonatologist and developmental neuroscientist, “has been a primary adviser for 40 mentees throughout their careers and embodies Children’s core values of Compassion, Commitment and Connection,” says Claire-Marie Vacher, Ph.D.
For these achievements, Dr. Penn was selected to receive the Ninth Annual Mentorship Award in Basic and Translational Science. The mentorship awards for Drs. Short and Penn were among dozens of honors given in conjunction with “Frontiers in Innovation,” the Ninth Annual Research and Education Week (REW) at Children’s National. 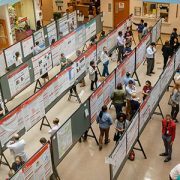 In addition to seven keynote lectures, more than 350 posters were submitted from researchers – from high-school students to full-time faculty – about basic and translational science, clinical research, community-based research, education, training and quality improvement; five poster presenters were showcased via Facebook Live events hosted by Children’s Hospital Foundation. View images from the REW2019 award ceremony. Tamp down food allergy anxieties with this quiz. 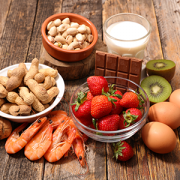 Food allergies are a growing public health problem and affect up to 8 percent of U.S. children, says Linda Herbert, Ph.D., director of the Psychosocial Clinical Program within Children’s Division of Allergy & Immunology. Children can be allergic to a wide range of foods and exposure to just a small amount of a food allergen can be life-threatening. Click through our quick quiz to learn strategies parents can tap to help tamp down their teen’s anxieties about food. 1. Children can only be allergic to peanuts and shellfish, right? 2. What emotional responses can teenagers have as they contend with food allergies? 3. Which red flags help parents determine if a child with a food allergy is depressed? 4. Parents who want to help children struggling with food allergy have few options. 5. My children have been affected by food allergies since they were toddlers. They know everything they need to know about this issue. 6. Children with food allergies can be bullied about it at school. We hope the information contained in this quiz helps you and your child to feel more engaged and empowered. Just remember, you’re not in this alone! If you are concerned and think your child needs more help than you can offer on your own, Children’s National has an allergy psychology program. Just call the main allergy line (202-476-3016) to request help. Imagine an endocrinology division staffed with endowed researchers, clinicians and specialists, that serves as an engine of innovation, making it easy for pediatricians to make the right referrals, based on the best research, to endocrinologists who can provide families with cutting-edge care. Andrew Dauber, M.D., MMSc, the new chief of endocrinology at Children’s National, is turning this dream into a reality. 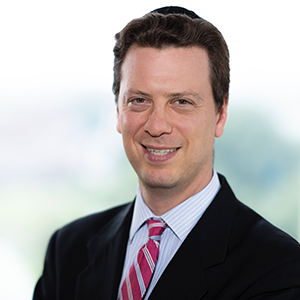 Over the next few years, Dr. Dauber will work with a nationally-ranked endocrinology and diabetes center to build a clinical endocrinology research program, housing specialty clinics for Turner’s syndrome, thyroid care and growth disorders, amongst others. 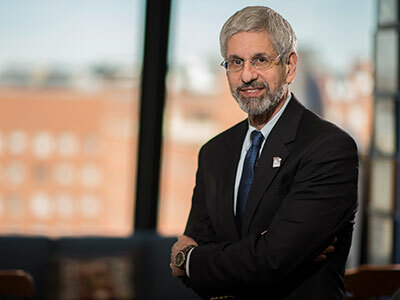 To put his real-life hypothesis of providing an engine for innovation into practice, Dr. Dauber led the interdisciplinary growth center at Cincinnati Children’s Hospital Medical Center and organized a Genomics First for Undiagnosed Diseases Program to study genetic clues for undiagnosed diseases. At Boston Children’s Hospital, he was the assistant medical director for the clinical research unit and held academic appointments with Harvard Medical School. Dr. Dauber finds it’s critically important to merge clinical practice with research and education. He received his medical degree and a Master’s of Medical Sciences in Clinical Investigation from Harvard Medical School. He has published more than 65 studies examining genetic clues to endocrine disorders, with a focus on short stature and growth disorders. Dr. Dauber conducted the majority of his research – ranging from studying genetic clues for rare growth disorders and causes of precocious puberty to genes that regulate the bioavailability of IGF1, insulin-like growth factor – while counseling patients, advising students and fellows, managing grants, reviewing studies and speaking at international pediatric endocrinology conferences. He’s harnessing this data by combining genomic insights with electronic health records and patient registries. While some of this information can be used immediately to identify a high-risk patient, other conditions may take years to understand. Dr. Dauber views this as an investment in the future of pediatric endocrinology. The Division of Diabetes and Endocrinology works with the National Institutes of Health, conducts independent research and received support from the Washington Nationals Dream Foundation for its diabetes program, the largest pediatric diabetes program in the region, which provides community education and counsels 1,800 pediatric patients each year. Susannah Jenkins, PA-C, guides a new training program for physician assistants. Susannah Jenkins, PA-C, lead physician assistant with the emergency medicine and trauma services department at Children’s National Health System, celebrates three years at Children’s National this September and she’s glad she transitioned from an adult surgical environment to the fast-paced, dynamic environment of working in pediatric emergency medicine (PEM). 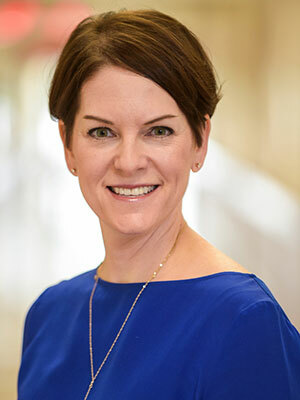 With 25 years of health care experience, 13 years as a physician assistant and 12 years as a nurse, Jenkins has worked in a variety of settings, inclusive of adult neurosurgery and high-risk OBGYN care. In addition to providing treatment for a range of pediatric patients, Jenkins works with Deena Berkowitz, M.D., M.P.H., a pediatric emergency medicine physician and assistant professor of pediatrics and emergency medicine at Children’s National and the George Washington University School of Medicine and Health Sciences, to train physician assistants, or PAs, to respond to urgent care needs within a Level 1 trauma center. With the encouragement and guidance of Dr. Berkowitz and Robert J. Freishtat, M.D., M.P.H., chief of emergency medicine at Children’s National, Jenkins expanded on an emergency medicine training program for PAs, which started at Children’s National in 2012. Jenkins presents the 12-month module at the American Academy of Physician Assistants 2018 Annual Conference in New Orleans on Saturday, May 19, 2018. Jenkins’ poster presentation, coauthored by Dr. Berkowitz, details the objectives, timeline, curriculum components and results that correspond with providing eight PAs with a 12-month training program to treat low-acuity pediatric patients at a Level 1 trauma center. The eight PAs who completed the 12-month program in 2017-18 saw 14 percent of the emergency care department’s low-acuity pediatric patients – patients seeking treatment for basic care, such as ear infections, conjunctivitis or strep throat – after 12 months of exhibiting competency in the program. The structured curriculum includes a two-month orientation followed by a 10-month provisional training module, inclusive of CME submissions, scientific literature reviews, journal discussions, case studies, chart reviews, team-based care and competency reviews. Jenkins is currently working with Dr. Berkowitz to develop guidelines for PAs treating medium-acuity patients, inclusive of patients seeking a higher level of primary care, such as for appendicitis, and for PA-training-programs that extend past one year. Jenkins notes the 12-month program she presents at the American Academy of Physician Assistants 2018 Annual Conference is a template that can be applied to any PA subspecialty and is a desirable program for both employers and PA applicants. Her guiding question isn’t on the final test but it helps her with the program design: How can we train PAs to provide the kind of care we want for our children, for our families and for our neighbors? Dr. Berkowitz agrees and is happy with the success the program has had in preparing an average of six to eight PAs each year with the tools they need to launch their career. 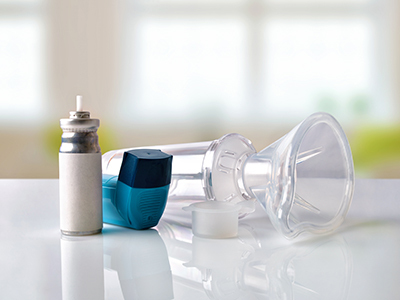 Pediatric asthma takes a heavy toll on patients and families alike. Affecting more than 7 million children in the U.S., it’s the most common nonsurgical diagnosis for pediatric hospital admission, with costs of more than $570 million annually. Understanding how to care for these young patients has significantly improved in the last several decades, leading the National Institutes of Health (NIH) to issue evidence-based guidelines on pediatric asthma in 1990. Despite knowing more about this respiratory ailment, overall morbidity – measured by attack rates, pediatric emergency department visits or hospitalizations – has not decreased over the last decade. However, Dr. Parikh notes, most of those quality-improvement papers do not focus on inpatient discharge, a particularly vulnerable time for patients. Up to 40 percent of children who are hospitalized for asthma-related concerns come back through the emergency department within one year. One-quarter of those kids are readmitted. 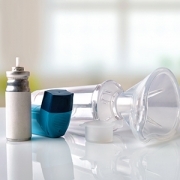 “It’s clear that we need to do better at keeping kids with asthma out of the hospital. The point at which they’re being discharged might be an effective time to intervene,” Dr. Parikh adds. To determine which interventions hold promise, Dr. Parikh and colleagues recently performed a systematic review of studies involving quality improvements after inpatient discharge. They published their findings in the May 2018 edition of the journal, Pediatrics. Because May is National Asthma and Allergy Awareness month, she adds, it’s a timely fit. The researchers combed the literature, looking for research that tested various interventions at the point of discharge for their effect on hospital readmission anywhere from fewer than 30 days after discharge to up to one year later. They specifically searched for papers published from 1991, the year after the NIH issued its original asthma care guidelines, until November 2016. Seven studies looked at the effect of multimodal interventions that combined any of these themes. When Dr. Parikh and colleagues examined the effects of each type of intervention on hospital readmission, they came to a stunning conclusion: No single category of intervention seemed to have any effect. Only multimodal interventions that combined multiple categories were effective at reducing the risk of readmission between 30 days and one year after initial discharge. One intervention that showed promise in their qualitative analysis of these studies, Dr. Parikh adds, is ensuring patients are discharged with medications in hand—a strategy that also has been examined at Children’s National. In Children’s focus groups, patients and their families have spoken about how having medications with them when they leave the hospital can boost compliance in taking them and avoid difficulties is getting to an outside pharmacy after discharge. Sometimes, they have said, the chaos of returning home can stymie efforts to stay on track with care, despite their best efforts. Anything that can ease that burden may help improve outcomes, Dr. Parikh says. In addition to Dr. Parikh, study co-authors include Susan Keller, MLS, MS-HIT, Children’s National; and Shawn Ralston, M.D., M.Sc., Children’s Hospital of Dartmouth-Hitchcock. Funding for this work was provided by the Agency for Healthcare Research and Quality (AHRQ) under grant K08HS024554. The content is solely the responsibility of the authors and does not necessarily represent the official views of AHRQ. 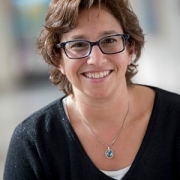 “As a community-focused health system, one of our central missions is to train a new generation of residents to create successful community partnerships and integrate public health concepts into the everyday practice of medicine to improve the health of underserved communities,” says Cara Lichtenstein, M.D., MPH. The Children’s National Community Health Track (CHT) has been recognized by the Academic Pediatric Association with its prestigious Teaching Program Award. The honor was made public at the Pediatric Academic Societies (PAS) annual meeting on May 7, 2018 in Toronto, Ontario. The purpose of the award is to foster interest in the teaching of general pediatrics by giving national recognition to an outstanding general pediatric program. The PAS selection committee chose Children’s CHT for demonstrating excellence in educational teaching methods, acceptance by the community, its adaptability and the outstanding quality of residents trained in the program. “As a community-focused health system, one of our central missions is to train a new generation of residents to create successful community partnerships and integrate public health concepts into the everyday practice of medicine to improve the health of underserved communities,” says Cara Lichtenstein, M.D., MPH and director of Children’s Community Health Track. Children’s CHT focuses on underserved populations and the development of skills in health policy, advocacy and community healthcare delivery. Residents spend their outpatient time learning to use public health techniques to identify and address community health needs, becoming a physician advocate and learning more about the sociocultural determinants of health and health disparities. Training for CHT is integrated with Children’s overall pediatrics residency program to ensure excellence in attainment of clinical skills, and to allow residents the opportunity to work with Children’s top-rated primary care, specialty and hospital-based physicians and care teams. This is the third time in recent years that Children’s National has been honored by the Academic Pediatric Association. 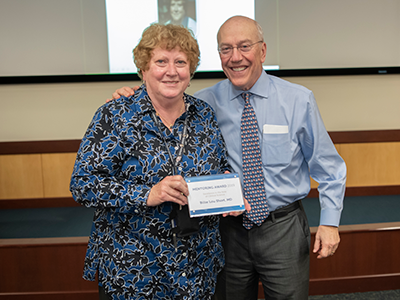 In 2013, Mary Ottolini, M.D., MPH and vice chair of medical education was recognized for her leadership of Children’s Master Teacher Leadership Development program. In 2009, Denice Cora-Bramble, M.D., MBA accepted the APA Health Care Delivery Award for the Goldberg Center for Community Pediatric Health at Children’s National. Grasp the breadth of diversity inherent in the pediatric population and be familiar with health-related implications of cultural beliefs and practices of groups represented in the community. Recognize the role of the pediatrician in identifying needs and facilitating access to resources for patients, families and communities. Be aware of the risks to health and barriers to care for underserved children in Washington, D.C., and demonstrate skill in improving access to continuous comprehensive health maintenance. Appreciate key issues related to the pediatrician’s role and interactions with local community agencies and advocacy groups. Value the role of schools and childcare settings in supporting the educational and psychosocial development of children and adolescents. Apply key principles about health promotion and disease prevention for children and adolescents over a set period of time. Observe, interpret and report observations about the communities in which they serve. The fundamental difference in this track compared to the more traditional Categorical Track lies in the outpatient experiences that occur in all three years of training. The CHT utilizes these outpatient experiences to help residents to attain a well-rounded community pediatrics experience. “Diversity powers innovation” was brought to life at Children’s National April 16 to 20, 2018, during the eighth annual Research and Education Week. Children’s faculty were honored as President’s Award winners and for exhibiting outstanding mentorship, while more than 360 scientific poster presentations were displayed throughout the Main Atrium. Two clinical researchers received Mentorship Awards for excellence in fostering the development of junior faculty. Lauren Kenworthy, Ph.D received the award for Translational Science and Murray M. Pollack, M.D., M.B.A., was recognized in the Clinical Science category as part of Children’s National Health System’s Research and Education Week 2018. Dr. Kenworthy has devoted her career to improving the lives of people on the autism spectrum and was cited by former mentees as an inspirational and tireless counselor. Her mentorship led to promising new lines of research investigating methods for engaging culturally diverse families in autism studies, as well as the impact of dual language exposure on cognition in autism. Meanwhile, Dr. Pollack was honored for his enduring focus on motivating early-career professionals to investigate outcomes in pediatric critical care, emergency medicine and neonatology. Dr. Pollack is one of the founders of the Collaborative Pediatric Critical Care Research Network. He developed PRISM 1 and 2, which has revolutionized pediatric intensive care by providing a methodology to predict mortality and outcome using standardly collected clinical data. Mentees credit Dr. Pollack with helping them develop critical thinking skills and encouraging them to address creativity and focus in their research agenda. 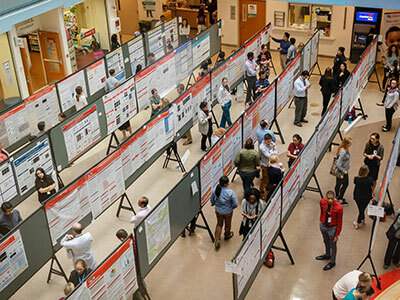 In addition to the Mentorship and President’s Awards, 34 other Children’s National faculty, residents, interns and research staff were among the winners of Poster Presentation awards. The event is a celebration of the commitment to improving pediatric health in the form of education, research, scholarship and innovation that occurs every day at Children’s National. Children’s Research Institute (CRI) served as host for the week’s events to showcase the breadth of research and education programs occurring within the entire health system, along with the rich demographic and cultural origins of the teams that make up Children’s National. The lineup of events included scientific poster presentations, as well as a full slate of guest lectures, educational workshops and panel discussions. “It’s critical that we provide pathways for young people of all backgrounds to pursue careers in science and medicine,” says Vittorio Gallo, Ph.D., Children’s chief research officer and CRI’s scientific director. “In an accelerated global research and health care environment, internationalization of innovation requires an understanding of cultural diversity and inclusion of different mindsets and broader spectrums of perspectives and expertise from a wide range of networks,” Gallo adds. 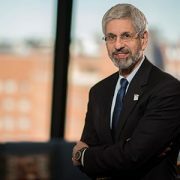 “Here at Children’s National we want our current and future clinician-researchers to reflect the patients we serve, which is why our emphasis this year was on harnessing diversity and inclusion as tools to power innovation,” says Mark L. Batshaw, M.D., physician-in-chief and chief academic officer of Children’s National. “Research and Education Week 2018 presented a perfect opportunity to celebrate the work of our diverse research, education and care teams, who have come together to find innovative solutions by working with local, national and international partners. This event highlights the ingenuity and inspiration that our researchers contribute to our mission of healing children,” Dr. Batshaw concludes. Education, training and program development. Each winner illustrated promising advances in the development of new therapies, diagnostics and medical devices. Diversity powers innovation: Vittorio Gallo, Ph.D.
Diversity powers innovation: Mark L. Batshaw, M.D. The day of discharge from a neonatal intensive care unit (NICU) can be overwhelming for families and for hospital staff. A Children’s National Health System team found that beginning discharge education early, communicating in ways attuned to families’ needs and using a classroom setting to teach hands-on skills for newborn care can improve parents’ experience during the discharge process, according to a study presented at the 2017 American Academy of Pediatrics (AAP) national conference. With discharge, the first hint of a problem in the NICU came from lagging Press Ganey scores, measures of families’ satisfaction with their overall hospital experience. Parents whose very sick infants had round-the-clock care felt overwhelmed by the array of skills they needed to learn to replicate that care at home. NICU staff determined the root cause of the problem and, using the Institute for Healthcare Improvement’s Model for Improvement, former NICU parents, nurse educators, family support specialists and quality improvement managers crafted strategies to ameliorate them. Already, Children’s NICU parents can “room in,” sleeping in their child’s room overnight as discharge nears in order to practice caring for a child with complex care needs. Children’s goal was to increase the number of discharge education sessions so that 90 percent of parents would receive discharge guidance more than 24 hours before their newborn was released from the NICU. The sessions included such staples as how to bathe and feed newborns who often were intubated; the benefits of skin-to-skin contact that characterizes kangaroo care; the child’s diagnosis and immunization status; optimal placement while sleeping; a hearing test and a car seat test, among other information. “When we speak with parents, they said ‘I had no idea my car seat expired. I had no idea I needed to stay for a car seat test. You had an x, y and z list for me to take my child home. Now, I’ve interacted with someone who told me about that check list and how important it is,’ ” Ridoré says. Many parents received the one-hour sessions in a classroom setting. On the door to their child’s room, they received alerts indicating whether they had completed courses. Beside the bed was a poster to help track progress toward discharge goals. According to the study authors, the initiative boosted the number of parents who received discharge training in the 24 hours prior to discharge by 27 percent, a figure that grew over time to a 36 percent boost in such timely communication. Satisfaction scores improved and, in interviews, NICU staff said the process improvements streamlined how much time it takes to prepare families for discharge. 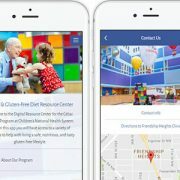 The Celiac Disease Program at Children’s National has created a new digital app for celiac disease and gluten-free diet management. Celiac disease affects approximately one in 100 children, making it one of the most common conditions in children. 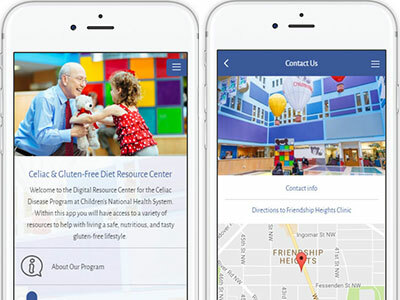 To help patients and their families understand more about the disease and live a safe, gluten-free lifestyle, the Celiac Disease Program at Children’s National has created a gluten-free diet app. Mary Ottolini, M.D., M.P.H., M.Ed., vice chair of medical education at Children’s National Health System and professor of pediatrics at The George Washington University, recently received the Council on Medical Student Education in Pediatrics (COMSEP) Achievement Award during the group’s annual meeting in Portland, Oregon. This prestigious award is given to a current or former COMSEP member who has made major contributions to the organization and its members. Since joining the organization in 2000, Dr. Ottolini has become a leader in the COMSEP Education Technology task force, a mentor to medical students, a teacher in clinical settings and an education innovator. Currently, Dr. Ottolini’s work with COMSEP is focused on overturning a Centers for Medicare & Medicaid Services regulation that bars medical students from documenting in the medical record, which interferes with their progress to becoming physicians. 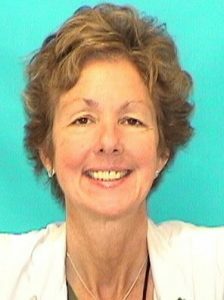 She continues to uphold the educational mission of Children’s National in caring for children by training the pediatric experts of tomorrow.